Friday night Sweet Pea asked to go to bed at about 7pm. This kiddo doesn't fight going to bed at 8pm, but she's usually not asking. And certainly not if playing some more is an option. So when she had a fever of 103 on Saturday morning, I wasn't shocked. My poor sick kiddo. With the help of tylenol and lots of fluids, her temp hovered around 100 degrees all day. At least we were able to keep it down. And in spite of being sick, she still played with her sister, interacted with us, and ate her meals. And drank cup after cup of water. In the few minutes it took for me to locate the ibuprofen, poor little Sweet Pea started throwing up and her temp when right back up to 104.9. So instead of hopping in bed, we hopped in the van and headed to the ER. Not part of my Saturday night plan! Walking outside in the cool night air with just a little t-shirt, Sweet Pea's temp was down to 104.3 when we got checked in. Since she decided to return the last of her stomach's contents on the office floor in the triage area, the nurse brought her some zofran once we were settled in our room. Supposedly, the little tablet doesn't really taste like much. Sweet Pea had some distinct opinions about how much she did not like it though. You say it needs to be under her tongue? How about if I can get it in her mouth at least momentarily before she spits it back out at me and acts like she is going to gag? I thought I was being rather ingenious to slip it in and stuff the paci in right afterwards, but Sweet Pea was too smart for me. She wasn't about the fall for such a trick! t know she didn't take it all, but she at least got part of it in. And she kept everything down after that as well, thankfully. After poking and prodding, and running several tests, the doctor felt confident saying that her high fever was caused by a nasty virus of some sort. 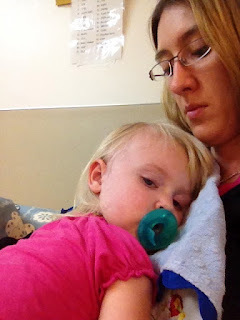 Poor baby had to be catheterized and have a throat swab done, all with mama the nurse helping to restrain her. No fun for either of us. I think the worst of it was hearing her scream, "No! No! Owie! No!" and know that there was nothing I could do but keep restraining her. 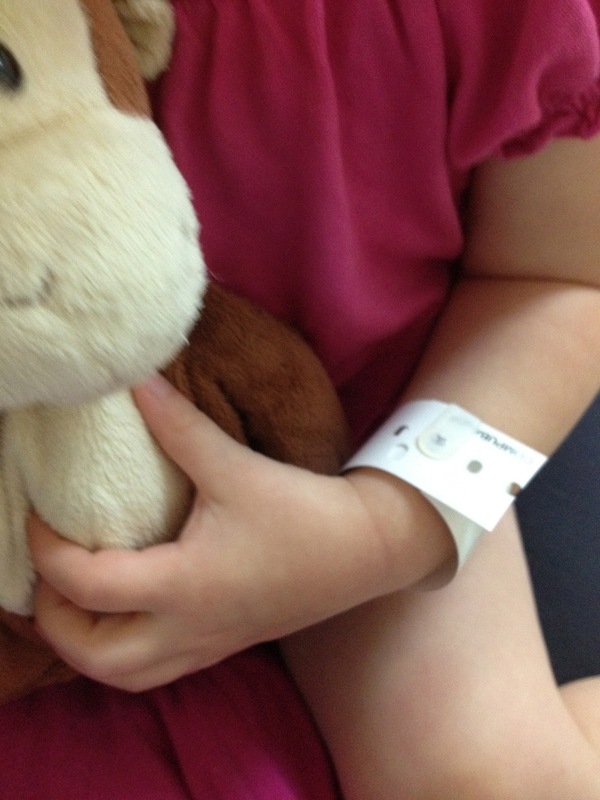 I agreed that the tests needed to be done to figure out what was going on in her little body. My prayers that it wouldn't be anything serious were answered, and after relaxing clothes-free on the final couch and having some ibuprofen, her temp finally came down ton 101.8. A whole heck of a lot better than where it had been before! Her little hospital armband - and Monkey, of course, had to come along. On the plus side, I now know where ER parking is located at the hospital I work at. 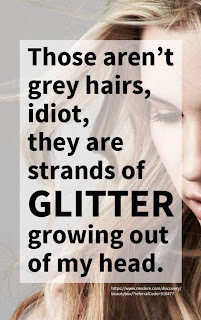 (blush!) And we know that Sweet Pea doesn't have some horrible infection or something raging through her little body. Update: By Monday morning (July 2nd), the fever had finally broken. 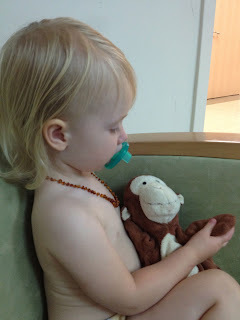 And by Monday night, my little kiddo had a rash covering her entire torso. It didn't bother her in the least, but it was there. 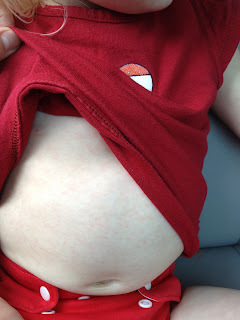 So being the self-diagnoser that I am, it looks like we had our first case of Roseola at our house. wowee glad that she is on the mend!!! PHEW poor mum! Super Undies to the Rescue!